I had the opportunity to attend a women's retreat this past weekend. 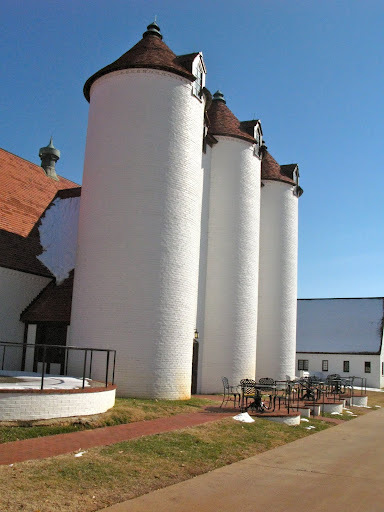 It was through Cup of Joy and was held at Winshape, a beautiful retreat site designed to resemble the countryside of Normandy. The whole place is breathtaking. I really wouldn't mind living there! Above was the morning view from my room. Not bad to wake up to, right? The theme of the weekend was rest...resting in God. God used this weekend to speak to me. I realized that I don't do a very good job of just abiding in Him. I am too often prone to trying to rely on my own abilities. And that is not what He desires for me. His desire is for me to lay my burdens down and rest in Him. After all, He is the one in control, not me. And for that I am forever grateful. I always leave your blog with a smile on my face. Perhaps it's the earnest fairy in the header and the overall simplicity of the blog page, but either way, it's a great place to visit! I just copied your link to my sister, who is going to Winshape for the first time this weekend for a women's retreat. Your photos are even better than their website's! that sounds like a marvelous weekend. What a beautiful place and a beautiful lesson!